When it comes to music, hearing is better than reading. So, along with a roundup of the news, there are samples embedded below. Tomorrow night is Algonquin’s Fall Instrumental Concert. 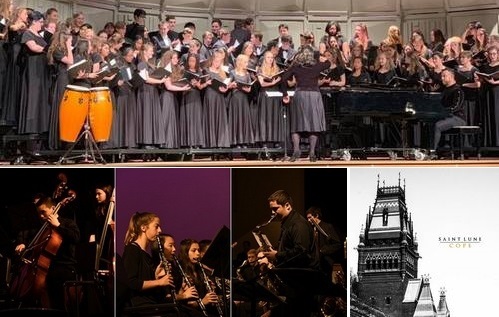 Th school’s Concert Band, Symphonic Band, Wind Ensemble, String Orchestra, Jazz Ensemble I and Jazz Ensemble II will make their debut performance for the 2018-2019 school year. You can hear another selection from the concert, “Oh, What a Beautiful City” here and check out more pics posted by NSMA to Facebook here. Southborough native son, Nate Scaringi, is putting his skills as a graduate from Algonquin’s music programs to work. Scaringi, currently a sophomore at Berklee, belongs to the band “Saint Lune”. The band just released its first album. Scaringi is credited as the Assistant Producer and Assistant Sound Engineer for the album “Cope”. He also performs on guitar and piano. You can learn more about the band, sample more songs, and purchase the album here. Update (10/31/18 10:59): I initially forgot to credit Andrew Michalik for last year’s fall instrumental pics.